Airwing Aviation Academy is ISO 9001-2015 Certified & Govt. registered pursuant to the provisions of the Indian Partnership Act, 1932 Registration No. 17/26/19/2013 and provides training in Aviation autonomous courses and others courses. 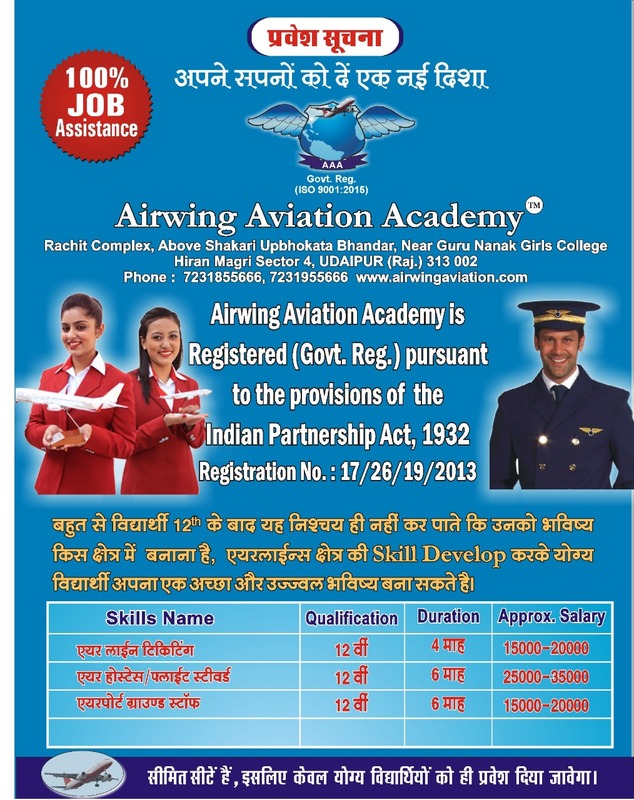 AIRWING AVIATION ACADEMY prepares young aspirants to become Airline Ticketing (Domestic/International), Air Hostess/ Flight Steward Training , Airport Ground Staff, etc. Our well trained and experienced faculty will give desired direction to the trainees through specially designed curriculum that has ample scope for practical/ Field Training and theory classes that will help the candidates in getting lucrative jobs in the best of the Airlines. Here at the AIRWING AVIATION ACADEMY own training programme and mentoring of our students is a high priority. We understand that the training breakthroughs of tomorrow will come from the students of today. Our aim is to provide a supportive and friendly environment that allows you to participate in great training, take on new advantage and new adventures, and enjoy yourself along the way. Our students will very active in a number of programs that bring together students and other academics inside and outside the Academy, and to ensure that student's interests are right at the top of the Academy’s agenda. I encourage you to consider us as you take your next step in a fulfilling and challenging career. AIRWING AVIATION ACADEMY has most meaning to it than just imparting technical knowledge to the students. The young aspirants who enter to the academy will have fulfilling and enriching experience . It has been started by the experience professionals in the field with an objective of producing train professionals who will be groomed to play satisfying role in the industry which has a lot of scope and requirement for the adequately trained personnels . The atmosphere in the academy is highly stimulating. With a rapidly changing technology , It has become difficult to race with the new technical systems introduced frequently . The human resources required to available , both in maintenance and operation is far from satisfactory . To keep abreast with the latest technological advancements in the field , a number of former Air Hostess and specialists from the Airline and Air Force have been included as the consultants who will share their experiences with academy students time to time.